In 10-inch skillet, heat 1 tablespoon of the oil over medium heat. Add onions and garlic; cook about 5 minutes, stirring occasionally, until onions are tender. Stir in spinach, salt, pepper and chopped basil. Cook 5 minutes, stirring occasionally. Remove skillet from heat; set aside. In small bowl, mix ricotta cheese, feta cheese and pine nuts; set aside. Unroll pizza crust dough on cookie sheet. Starting at center, press out dough into 15x10-inch rectangle. Brush 1 tablespoon oil over dough. 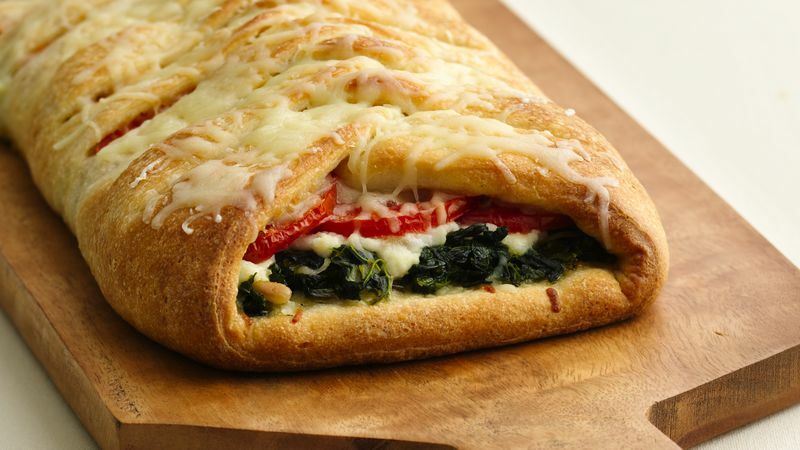 Sprinkle 1/2 cup of the Italian cheese in 5-inch-wide strip lengthwise down center of dough. Spoon spinach mixture over cheese. Spread ricotta mixture over spinach. Layer tomato slices, overlapping, on ricotta mixture. Drizzle 1 tablespoon oil over tomatoes. Sprinkle with 1/2 cup Italian cheese. Using kitchen scissors or sharp knife, make cuts 1 inch apart on each long side of rectangle to within 1/2 inch of filling. Fold strips of dough diagonally over filling, alternating from side to side. Turn ends under; press to seal. Brush remaining 1 tablespoon oil over top of braid. Bake 18 to 23 minutes or until crust is deep golden brown. Remove from oven. Sprinkle remaining 1/2 cup Italian cheese over top of braid. Bake about 1 minute longer or until cheese is melted. Let stand 10 minutes. Remove from cookie sheet to cutting board; cut crosswise into slices. Garnish with basil sprigs.